Book Summary: Good to Great by Jim Collins. In this article, we’ll summarize the key points of the classic business book, Good to Great by Jim Collins. Some companies have always been great, such as Coca-Cola. This book isn’t about this type of company. It’s about companies who were good for a long time and then somehow became great for a long time. To find those companies 1,435 companies were examined over a 40 year period. From this research, eleven great companies were found. And the question this book attempts to answer is how did these companies become great, and are those lessons repeatable? The answer is surprisingly simple, pragmatic and straightforward. You can see a summary of the Good to Great process in the diagram below. If we had to describe the key concept of the book in a single word, that word would be discipline. Discipline. Discipline. Discipline. To go from a good company to a great company you need disciplined people, disciplined thought, and disciplined action. Disciplined people: means getting the right people and keeping them focused on excellence. Disciplined thought: means being honest about the facts and avoid getting sidetracked. Disciplined action: means understanding what is important to achieve and what isn’t. 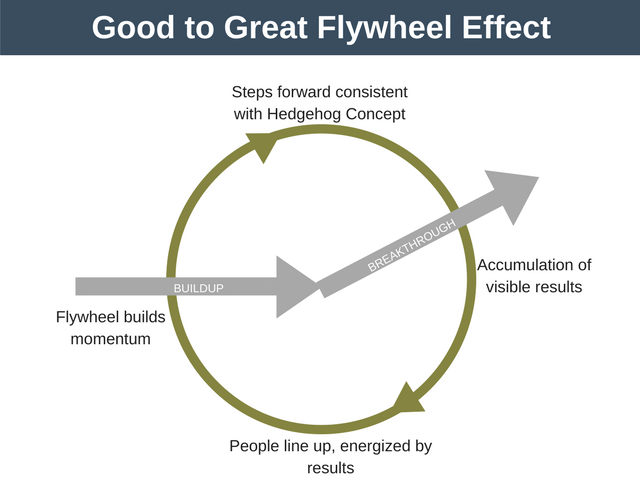 As you can see from the diagram as we move from Good to Great there is a “flywheel” effect. The first three concepts slowly build its momentum. Then there is a breakthrough and the momentum is almost self-fulfilling. A company can spend years of consistent effort to get the flywheel up to speed. But once the flywheel is up to speed the company can sustain years of breakthrough performance. The book is about being great, not merely good. Good is the enemy of great. Many people and companies settle for good because it’s easier. Many companies don’t even try to be great. There’re not striving to be the best in the industry. This opens the door to competitors. Being the best means there is absolutely no room for mediocre thinking. It’s the same in our lives. Few people lead great lives. This is because they’re happy with living a good life. There’s a lot to cover in this summary, so let’s jump in at look at the first of our 6 concepts. 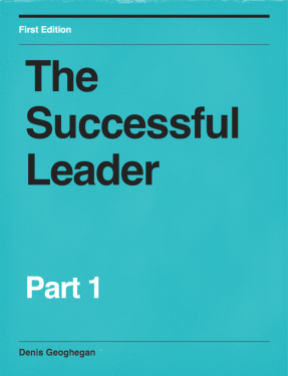 The first concept of the book is Level 5 Leadership. Every great company Collin’s studied had the same type of leader – Level 5 Leaders. If you think about an organizational hierarchy, the lowest level of leadership is the Highly Capable Individual. These are people who contribute using their skills, know-how and good work habits. Moving a step up the hierarchy, the next level is a Contributing Team Member. These are people who are able to use their skills and knowledge to help their team succeed. The next level is Competent Manager. These managers are capable of organizing their team to efficiently reach pre-determined objectives. 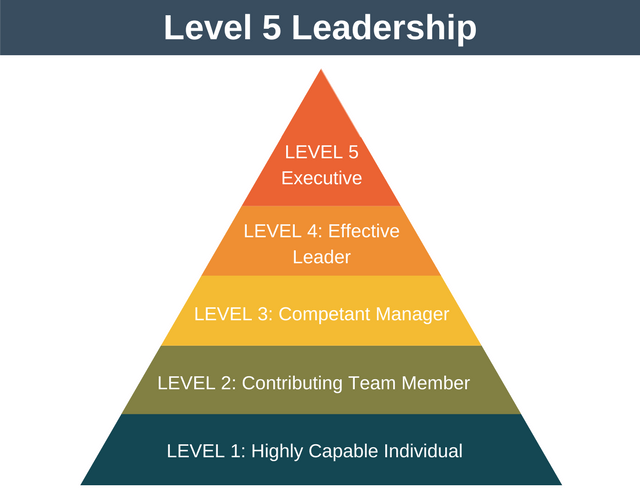 Level 4 is Effective Leaders. This is where the majority of leaders can be found. They are able to create the commitment from their team to vigorously pursue a clear and compelling vision. They’re also able to create a high-performing team. Finally, we reach Level 5 Leadership. These are the great leaders. They have the abilities of the other four levels plus a unique combination of will and humility. And it is this combination that makes them great. Paradox: They are ambitious, but their ambition is for the organization to excel rather than themselves. At the same time, they tend to be modest about what they personally contribute and are self-effacing. Driven: They are fanatically driven, obsessed even, to produce exceptional results on a sustainable basis. The key word here is sustainable. This isn’t the result of a one-off heroic effort. Build successors: They build successors to be even more successful. This is in contrast to level 4 leaders who will sometimes set up their successors for failure to make themselves look good. Share praise: They share the praise amongst the team when things go well. Take blame: They are happy to take the blame when things go wrong. By sharing the praise and taking the blame they make their team extremely loyal and committed to them. Normal people: They never have larger than life personalities or celebrities. Come from within the organization: This is because their greatness comes from quiet hard-work, rather than heroic acts. You should try to develop these traits if you want to become a Level 5 Leader. Look for great results without an individual claiming the credit. You may just already have a Level 5 Leader working for you. Practice the Good to Great concepts. This will encourage the development of Level 5 Leaders. Hire from within. Avoid the temptation to recruit external talent. Invest in personal development, coaching and mentoring for your team. Note that we have a whole section of this website dedicated to helping you improve your leadership skills. This is the second concept of disciplined people. It’s not just the quality of leadership that is important to be great. The quality of all other people in the team is equally as important. What does first who, then what mean? It is very opposite of what we normally think of planning as being. It means that you don’t decide what you want to do and then get the people you need to do it. Instead, you start by getting the right people into the organization and the wrong people out. Getting the right people takes precedence over strategy, over vision, over almost everything. First, you get the right people. Then you let them work out where you’re going to go, what you’re going to do, and how you’re going to do it. Frist who, then what means shifting your mindset to realize that people are not your most valuable asset, the right people are. It’s easier to change direction because people are present because of who they get to work with rather than what they are working on. You won’t have to waste time and energy motivating and managing your team. They’ll be self-motivating and manage themselves. It gives the organization the potential to become great. A company with the wrong people can never become great. Principle 1: When in doubt, don’t hire – keep looking. Great companies are prepared to grow only at the rate they can hire the right people. Principle 2: When you know you need to make a change in personnel, act right away. You must let go of the wrong people. It isn’t fair on them and it’s not fair on the organization to keep them around. But a word of caution: don’t overlook the possibility that the right person might just be in the wrong position. Principles 1 and 2 can be summed up as: hire slow and fire fast. Principle 3: Put your best people on your biggest opportunities. Managing problems well can make your organization good, but only exploiting opportunities can make you great. So put your best people precisely where they can generate the biggest opportunities. If you decide to sell off a problem business, great companies sell off the business unit but they hang on to the best people. By focussing on who first you get many benefits. The best people will be debating what the “what” should be. This gives you a better chance of making the right “what” decision. With the right people in place, everyone will enjoy their work, and meetings will become something to look forward to. Friendships form in the workplace, that then create great personal friendships. It’s impossible to overstress how important it is to have the right people in place… the right people simply won’t be satisfied with anything other than greatness. If you have Level 5 Leadership, and you have the right people, then the whole organization is able to put company performance ahead of their own ego. This enables you to confront the brutal facts, without losing faith that the company will be successful. Great results can only be achieved when you making lots of good decisions and then execute well. To make good decisions you need to confront the facts, even if those facts are brutal and uncomfortable. To avoid distorting the facts you need an atmosphere where the truth is welcomed. 1. Lead with questions not with answers. The leaders of Good to Great companies start by assuming they don’t know what is required. They ask questions until a picture of reality and its implications emerges. The continued use of probing questions slowly brings the reality to the surface. This is the opposite of superstar leaders who assume they have all the answers and just need to make their team execute. These leaders are likely to make bad decisions because they don’t have a true understanding of the facts. 2. Engage in dialog and debate, not coercion. Engage in a debate, have heated discussions, even agree to disagree, but great leaders never coerce people. 3. Conduct autopsies without blame and use them to learn. Things can and will go wrong. Even great companies make mistakes. Great companies don’t try to hide these mistakes. Rather, they try to learn from them. Trying to blame someone for the mistake doesn’t even enter into the conscious thoughts of Good to Great leaders. 4. Build red flag mechanisms. Great companies pay attention to what’s really important and ignore everything else. They build red flag mechanisms. These turn raw data into information that cannot be ignored. The organization becomes more resilient. People become excited about the chance to take on a challenge that seems impossible. It can create duality. One the one hand people accept the brutal facts. On the other, they maintain the faith that the company will ultimately be successful. Even if it takes many years. It dampens charismatic leaders. The brutal reality is more important than how a leader thinks the market should behave. Leaders will be fact led rather than personality led. It keeps motivation high. The reality is that pretending the realities of the marketplace don’t exist will sap everyone’s motivation. They’ll just be going through the motions. In summary, confronting the brutal facts means its fine to have an ambitious destination in mind, as long as you continually adapt your plan every day as new brutal facts emerge. Before we move on to the 4th concept let’s briefly look at something called The Stockdale Paradox. The concept is named after James Stockdale, who was a US Navy Vice-Admiral. Stockdale was a prisoner of war for over seven years during which time he was tortured many times. When asked how he handled the uncertainty of his outcome he said essentially that he never doubted that he would survive. Not only that, he never doubted that he would turn the experience into one of the defining experiences of his life. One which he wouldn’t trade for anything. When asked which kind of people didn’t survive, Stockdale said it was the optimists. The ones who, for example, believed they’d be out by Christmas. Christmas then came and went. And so did the following Christmas. And several more. And eventually, they gave up and died demoralized and of a broken heart. So, as you can see the Stockdale Paradox is a philosophy of duality. It involves having the discipline to confront the brutal facts about your situation. But at the same time, it involves never losing faith that you will prevail in the end. Business, and of course life, will inevitably throw lots of difficulties at us. But it is how we handle these difficulties that will have the biggest impact on the course of our lives and our business. The fourth step of going from Good to Great is the Hedgehog Concept. To explain this concept let’s look at the difference between a fox and a hedgehog. A fox is a very clever creature. It sees the world in all its complexity and can pursue many goals at once. A hedgehog is a much more simple creature. It doesn’t get bogged down by all the complexity. It’s really only able to do one thing well – curl up into a ball to protect itself. Hedgehogs are not capable of seeing complexity. All they see is a single goal and they execute to achieve that goal. Good to Great companies behave in a similar way to a hedgehog. They stick to doing what they’re best at and avoid getting distracted. It’s incredibly easy to get distracted, with even great companies having to fight to stop this from happening. This is an important question because passion is hugely motivating. Great companies don’t tell their employees what to be passionate about. They find what their employees are already passionate about and then look for projects aligned to those passions. This is about more than developing a great core competency. It’s about deciding on one key area that your business can do better than any other business. It’s then about focusing on this area exclusively so nobody else can match you. Note that this is about focusing on what you can be the best at, not what you want to be the best at. What is the one factor that creates money for your organization? You think of the economic engine as being like the blood flowing through our bodies. It doesn’t define us and it’s not who we are and what we are about, but without it we simply can’t survive very long. If the company is working at the intersection of all three questions. Of passion. Of being the best. In an area where money can be created. Then it’s going to be likely that the company will be successful. It takes time to develop your Hedgehog Concept. It’s not going to happen overnight, in a flash of brilliant inspiration. To help develop their Hedgehog Concept many companies use a Business Council. A business council is a group of people from different areas of the business who meet regularly. They are tasked with finding the Hedgehog Concept. Once the Hedgehog Concept is found they are tasked with ensuring it is being ruthlessly driven forward. 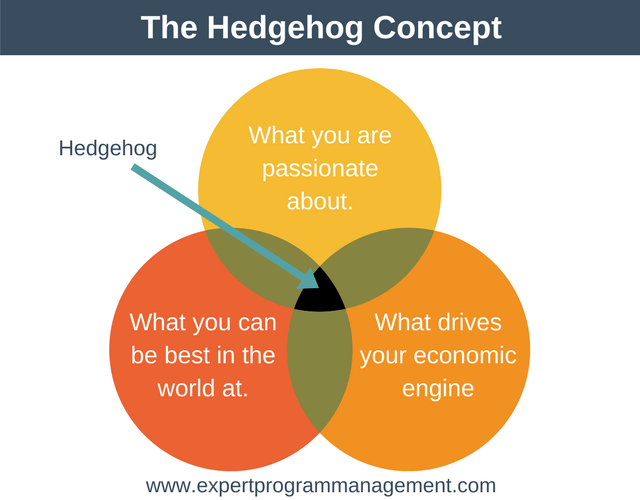 The Hedgehog Concept is a turning point in the journey from Good to Great. The remaining concepts only make sense if you have your Hedgehog Concept in place. Be prepared for it to take several years to find your Hedgehog Concept. Having discipline of people eliminates the need for hierarchy. Having discipline of thought keeps everyone on track. Now we move to the discipline of action which eliminates the need for bureaucracy. This means that there is no need to excessively control the actions of your people. Most companies fail not because of the lack of opportunity but because there is too much opportunity, and they spread themselves too thinly. 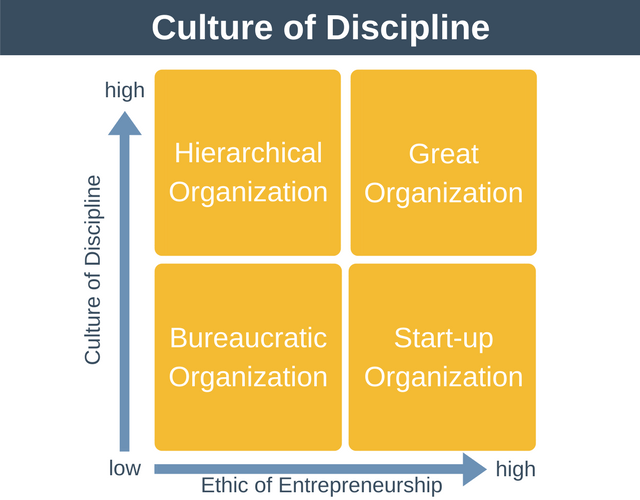 A culture of discipline means having the organization full of people who will take action consistent with the hedgehog principle. Don’t make the mistake of many executives: mistaking control for discipline. 1. Build a culture of freedom and responsibility but within a defined framework. You will free up your time if you put in place boundaries but let people decide for themselves how to act within those boundaries. All you’ll have to do is manage the system itself. The best way to explain this is by using the example of an airline pilot. The pilot is guided by air-traffic control. But the pilot has ultimate responsibility within that system for the safety of the craft, its passengers, and its crew. 2. Get the right people on board. Those that have the will to achieve their responsibilities. Then having the discipline to do what needs to be done to reach their objectives. 3. Build a strong culture, not a dictatorship. It’s not about driving your team relentlessly. It’s more about creating a culture where the team wants to achieve. Obviously, the Hedgehog Concept will help here as it keeps everyone focused. If you want to be average, start by trying to be great at lots of things. Good to Great companies keep focusing on their Hedgehog Concept and avoid everything else. Paradoxically, this can actually create more opportunities for growth than if you try to do everything. Create a list of things you will stop doing so you can better focus on your Hedgehog Concept. Change the way you plan. Instead of thinking which projects should get which people, think which projects support your Hedgehog Concept. Those that do get more funding. Those that don’t support the Hedgehog Concept get less funding or are scrapped. A key takeaway from this chapter is that discipline on its own is pointless. There are many examples from history where people have marched with discipline into disaster. The key to going from Good to Great is to: get the right people, engaging in critical thinking, then taking disciplined action aligned with the Hedgehog Concept. Good to Great companies think about technology in a different way. They will invest in new technology only if it serves their Hedgehog Concept. 1. They view technology in light of their Hedgehog Concept. They ask if a new technology fits with their Hedgehog Concept. Only if there is a fit will they then invest in it. 2. They become pioneers of technology aligned to their Hedgehog Concept. They use technology to speed up the momentum they already have. This is part of their disciplined approached to excelling at their Hedgehog Concept. 3. They use technology in unique ways. Because they examine technology through the lens of their Hedgehog Concept they will often use technology in ways other than intended. 4. They maintain a balanced view of technology. This means that they view how technology is used as being far more important than adopting the latest technology. Let’s revisit the flywheel we mentioned at the beginning of this article. Imagine a very large flywheel. Thousands of kilograms or pounds in weight. To get it to spin you need to start pushing it. As you begin to push you might make one single step of progress. Then another step. Then another step. A single push as no impact on the wheel. Even a singular massive push has no impact on the wheel. As you first start to push it seems almost impossible to turn. But you keep at it. Pushing it, and pushing it, and pushing it. The more momentum you build up the easier it gets but you still need to keep pushing hard. Then at some point, as you run behind this giant flywheel, it takes on a life of its own and its spinning really fast and doesn’t need as much effort to spin. In fact, now its really difficult to stop! We have achieved a Good to Great Flywheel Effect. We are taking consistent action in alignment with our Hedgehog Concept. We are then achieving some visible results. This, in turn, energizes people and momentum is easy to sustain without much effort. The media is obsessed with moments of breakthrough and inspiration. But, if someone came to you and enquired as to what was the one big push that made your flywheel spin so fast what would you say? You wouldn’t be able to answer! Because there was no singular thing you did that made the difference. It’s about consistency over a long period of time. A key concept here is to realize that no single push makes a difference. No matter how herculean the effort. So you have to be thinking about cumulative effects, not looking for the dramatic singular win. 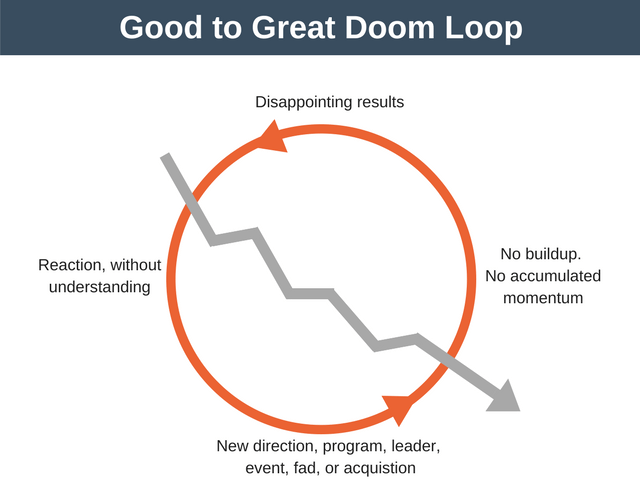 The doom loop is the opposite and it is how bad companies do things. They start with a great idea or a flash of brilliance. But then they work on it intermittently, giving only intermittent big pushes. These huge efforts are exhausting. Over time, their intermittent nature leads to poor results. This, in turn, causes the firm to switch to a new idea because the previous one didn’t work out the way they’d hoped. Each time they switch idea momentum is lost. These companies completely stop trying to create momentum. Instead, they are focused on having one breakthrough. This breakthrough never comes. 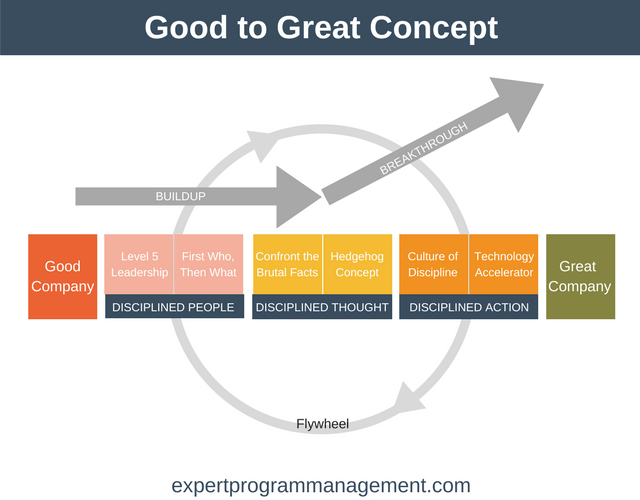 The absolute key thing to remember in this flywheel analogy is that each push on the flywheel builds on all the previous thousands of pushes and moves you one step closer to going from good to great. The key takeaway from Good to Great is discipline. To go from a good organization to a great one you need disciplined people, disciplined thought, and disciplined action. The key to going from Good to Great is to get the right people onboard, engaging in critical thinking, then taking disciplined action aligned with the Hedgehog Concept.